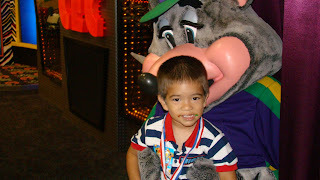 Samuel marked his 3rd birthday yesterday at Chuckie Cheese. He always like playing there, So I thought it would be a great place to have a birthday party for him. 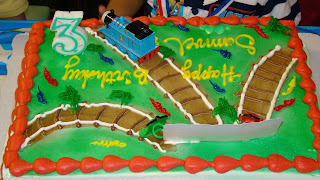 His cake has a motif of Thomas the train that matches his shirt. He really lov es train. Relatives and friends came to witness the celebration of my dear son's 3rd birthday. I prepared tons of tokens for kids to play the games with, but they have so much fun to use the tokens very quickly. I saw one kid at Samuels party jumping because of excitement. One kid would not eat anything and would just play. That's why when it's time for us to sing happy birthday, it was so hard to keep the kids in one place because of their excitement to play the games. I thought the presentation was just alright. There were some things that I expected but did not happen, some things that I should have done but I was so busy. Jason was the one who took pictures. I looked at them this morning and I was not satisfied. Haha, I am not perfectionist or something.But there were not enough pictures of Samuel, especially with the cake and friends. Well, I would not blame him, It's kinda hard to take pictures when you are entertaining friends and doing something. 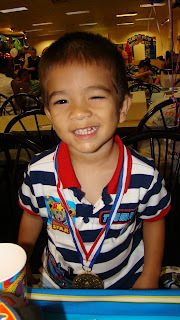 But it was a successful birthday party, my son who was the star of the day had a wonderful day and an unforgettable one. Of course, everyone had fun too!